Keeping your garden free from weeds can be a tiresome and back-breaking job. 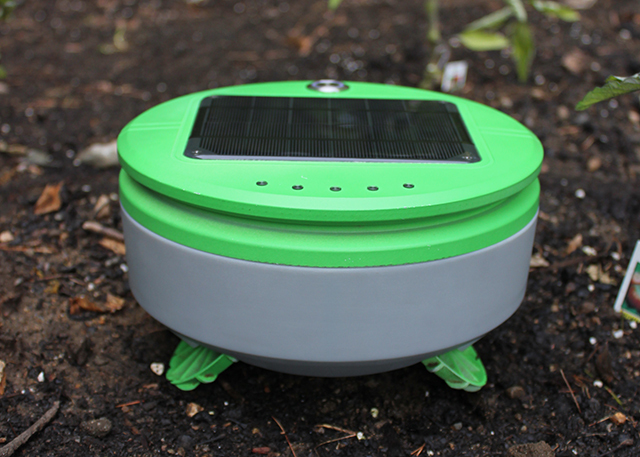 Thankfully, Joe Jones, the creator of iRobot’s Roomba, has a solution -- a solar-powered robot that lives in home gardens and weeds every day so you don’t need to. I spoke with Joe about his new creation Tertill which, after two years development, is set to finally graduate from prototype to product this month. BN: Can you tell me about yourself and your background? JJ: I grew up in a little rural community in the Missouri Ozarks. I majored in physics at MIT but ended up in robotics when I got a job at the MIT AI Lab after taking a year-long trip around the world a few years after college. While working at the AI Lab (in 1989) I got the idea for Roomba. In 1992 I became the first full-time hire at iRobot. There I worked on a bunch of robots until, in 1999, my colleague, Paul Sandin and I proposed Roomba to the iRobot management. They agreed and Paul and I worked on the team that developed Roomba. BN: And that weeding robot is Tertill. How does it work? JJ: Tertill lives in the garden and keeps weeds at bay with almost no attention from the gardener. It uses a string trimmer to chop down weeds, and its wheels also damage pre-emergent weeds. Tertill attacks weeds every day, so if a chopped weed grows back it will be chopped again and again and eventually run out of stored energy and die. BN: How does Tertill differentiate between weeds and plants? JJ: By height. As Tertill sees it, small plants are weeds, big plants are crops. If you have seedlings you can place a supplied collar around them and this will inform Tertill that this plant is wanted. You can remove the collar once the plant is well established. BN: What size gardens is it suitable for? JJ: One Tertill can easily keep up with the weeds in a typical garden. In the US, the area of a typical garden is about 100 square feet. Tertill will usually handle gardens considerably larger than this but how much larger depends on weather and local weed types. BN: Can you have more than one Tertill working at a time in a larger garden? JJ: Yes. Currently, multiple Tertill robots will simply avoid each other. Several can coexist harmoniously in the same space. BN: How do owners charge Tertill’s battery? JJ: Under normal circumstances you never need to charge Tertill’s battery -- the sun does that. If Tertill has been in the dark for so long (months) that its battery is completely exhausted, a USB connection can be used to charge the battery. JJ: Tertill’s expected price will be around $300. Models with different features may be priced differently. Regulatory compliance is difficult in other countries so initially Tertill will only be offered in the US. Our Kickstarter starts on June 13. We plan to ship robots in time for next year's growing season. BN: There are robots for vacuuming homes, mowing the lawn, and now weeding. What other areas do you see robots moving into? JJ: I think there are many near-term opportunities for robots in agriculture. But I can’t make blanket statements about other areas. Whether a robot can be designed for a particular application depends critically on the details of the task you’d like the robot to do. It takes a deep understanding of both the technology and economics of the proposed application area to know. That, I think, is one of the things that is slowing the advance of robots. Robot designer don’t generally have deep understanding of many industries and practitioners in those industries (who do) don’t have a clear understanding of where robots might be able to help. You can find out more about Tertill and Franklin Robotics here. The Kickstarter is live now here. [Update] Since this Q&A was published, Franklin Robotics has doubled its funding goal, collected $250,000+ in pledges, and attracted over 1000 backers. The clock is nearing zero, however -- Tuesday is the last full day for backers to take advantage of the discount price and early delivery date.